Bicycling is a top choice for many people hoping to combine exercise with recreation, and with the right seniors' bicycle accessories, people over age 55 can get in on the fun. Will you commute to work? Are you looking for a classic style built for comfort? Think tandem biking would be a fun couple's activity? Does off-road biking sound interesting, or would you rather ride paved trails? 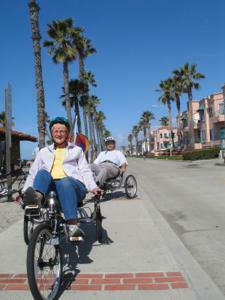 Do you hope that riding a recumbent bicycle provides arthritis pain relief or alleviates neck or wrist problems? Are you willing to do your own bike maintenance? Your answers will not only steer you in the right direction for the type of bike you'll enjoy, but also help you sort through the options for various accessories. Expect to pay $150-$500 for a steel-frame, basic touring or mountain bike, and $500 and up for aluminum and specialty bikes. Schwinn, one of the most popular and memorable bicycle brands, still manufactures numerous types of bikes. The bike finder feature on their website helps you narrow the selection based on your interests. There is a wide selection of seniors' bicycle accessories to modify a bike to your frame, help you ride longer, and most important, keep you comfortable. When you purchase a bike, you want to make sure the frame suits your body style. Saddle height: Most bikes have an adjustable bar that allows the saddle to move up or down for the right fit. When you sit on the bike, your leg should almost straighten on the downstroke, with a slight bend at the knee. Standing height: Generally, you want at least two inches of clearance between you and the bike's parallel bar (the crossbar that connects the handlebar to the seat stem). Handlebar height: If you have longer legs and a shorter torso, you need to make sure that you're not overextending to reach the handlebars. Your handlebar stem should be about one inch above the nose of your seat to avoid lower back strain. If you need a little extra assistance, these seniors' bicycle accessories should help. Handlebar extensions: Fitted extensions connect to either the handle ends or the handlebar stem. Extensions reduce wrist, shoulder, and neck strain. Pedal changes: Many riders choose to replace the standard pedals for units that offer better foot control, less slippage or extra comfort. Special saddles: Saddle manufacturers now construct bike seats with gel-filled pads and extra foam. You might also consider a wider saddle, or a gender-based seat designed to provide optimum comfort. Bike shorts and liners: These padded wonders help ease the pain of long rides. Lotion: Professional bikers rely on lotion applied prior to a ride to reduce friction and the likelihood of saddle sores. Gloves: Some senior riders don't like the bikes' handle grips. Padded gloves provide an extra layer to absorb shock. Riding with a helmet and reflectors makes good sense. So add the following to your purchase budget. Helmet: Durable helmets cost $40-$70. Think you don't need one? Read this guide, from helmets.org. Helmet mirror: These handy devices work just like a car's rearview mirror, as they allow cyclists to focus ahead while monitoring traffic behind. Reflectors: Ensure your model sports enough reflectors for your cycling needs, on the backend and pedals, especially. You might also consider wearing reflective clothing. Water bottles and brackets: A simple bracket mounted to the crossbar will hold a standard 12oz. bottle of water. For longer rides, get a hydration pack. Bike pump: Miniature bike pumps can also be attached to the crossbar to help mend a pesky flat. Saddle bag: Saddle bags and handlebar packs carry all your sporting items, bike tools, and other gear. Speedometer: Track your miles traveled, your overall speed, and even calories burned with one of these units. Your local bike shop: If you haven't been in the saddle for a while, you'll appreciate the one-on-one attention extended to you by the avid riders manning the store. The trade off is that prices for seniors' bicycle accessories might be a bit higher than at the larger chain stores. These shops are also the best outlets for learning about biking clubs and get-togethers with other enthusiasts. Scheel's All Sports: This large Midwest-based sporting goods store stocks an enormous selection of biking accessories. REI: A national store with biking advisors available to help you make the right selection of seniors' bicycle accessories. You can order both in-store and online. Maybe it has been a few years since you were on a two-wheeler. Don't let that be a deterrent to an enjoyable and ageless activity. Even if you only ride a few miles a week, you have a wonderful outlet to increase your health and wellness, experience nature, and expand your socialization. 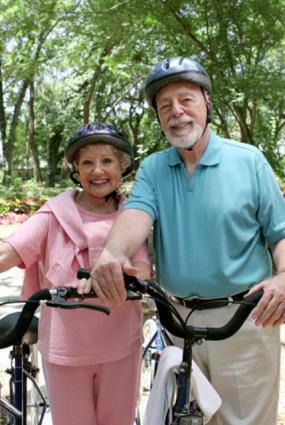 Bike Friday celebrates biking enthusiasts of all ages, especially those aged 55 and older. The League of American Bicyclists is a wonderful resource for senior riders searching for local community rides and biking activities.